King Abdullah vows to 'confront' Israel over any attempts to increase Jewish prayer rights at holy sites as Temple Mount storm continues. 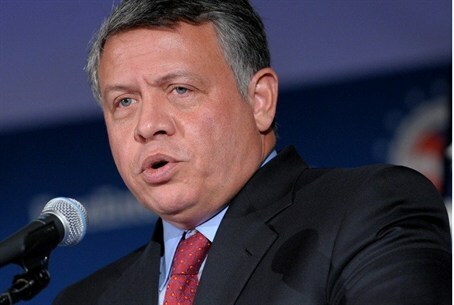 Jordan's King Abdullah II vowed on Sunday to oppose any Israeli attempt to change the "status quo" regarding holy sites in Jerusalem - referring to the ongoing controversy surrounding the Temple Mount. "Jordan will continue to confront, through all available means, Israeli unilateral policies and measures in Jerusalem and preserve its Muslim and Christian holy sites, until peace is restored to the land of peace," the king said in a speech which notably made no mention of Jewish holy sites in the Israeli capital. Jordan, which occupied east Jerusalem and Judea-Samaria in 1948 before Israel liberated the territories in the 1967 Six Day War, maintains control over holy sites in Arab-majority parts of the city via the Jordanian government-run Waqf Islamic trust. Although it is Judaism's holiest site, Jews are forbidden to pray on the Temple Mount as part of that arrangement, and Jewish visits are tightly regulated - with those deemed to be praying subjected to arrest. Jewish activists have been campaigning against the current status quo, which they brand as a capitulation by Israel to pressure from Jordan, and threats of violence from Islamist groups and the Palestinian Authority. In response, Muslim extremists have upped their campaign against any Jewish presence on the Mount - which houses the Al Aqsa Mosque complex - by harassing and threatening Jewish activists. That campaign reached a violent crescendo last week when prominent Jewish Temple Mount campaigner Rabbi Yehuda Glick was shot and seriously wounded in an attempted assassination. King Abdullah's combative rhetoric notwithstanding, Israeli Prime Minister Binyamin Netanyahu has already guaranteed on numerous occasions that the status quo will remain in place on the Temple Mount. On Saturday night and again during the cabinet meeting Sunday morning, the PM urged MKs to help "cool" the situation.